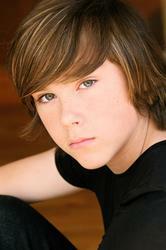 Jeremy Shada began acting at the age of seven soon after moving to Los Angeles with his family. He was inspired to act by his older brother Zack Shada, who had begun acting himself. Shada initially appeared in commercials. Later on, he began auditioning for voice acting and theatrical performances, taking the advice from a voice over agent. His first live action theatrical role was as Young Kurt Diamond in No Rules. He has since appeared in additional live action and voice acting roles, such as playing Charlie Pace in childhood flashbacks on Lost. In 2009, Jeremy Shada's agent approached him with the idea of auditioning for the role of Finn. Both recognized that Zack Shada had been the original voice of Finn in the pilot episode of Adventure Time three years before. After viewing the pilot on YouTube, Shada matched his voice with the voice of Zack Shada in auditions with Adventure Time's creator Pendleton Ward and the show's producers, earning him the Finn role. In 2012, Shada joined the cast of Nick Cannon's sketch-comedy show, Incredible Crew. In June 2012, to promote the Incredible Crew series premiere, Cartoon Network released a music rap video titled "Running Errands with My Mom" which features Shada performing and rapping the lyrics. The video has since generated over one million views.